This story begins nearly forty years ago in the fall of 1979 when I was working as a teacher’s assistant at Lorena Street School in Boyle Heights. One of my colleagues was Daniel Villarreal. A few years later, while working as a production assistant on the film Stand & Deliver, Edward James Olmos chose him to play the part of Chuco in the very same film. Before he was an actor Daniel studied photography and introduced me to photography as well. It changed my life. This is how it all began. Daniel was studying photography at East Los Angeles College and I admired his sense of composition and the fact that he developed and printed his own photographs. He introduced me to Bill Maxwell director of the All Nations Neighborhood Center across the street from Daniel’s apartment on the corner of Soto and Michigan Avenues. On my first visit to the Center, we chatted briefly and Bill asked if I was also interested in photography. I said sure without giving it much thought and then he instructed Daniel to take me to the storeroom and give me a camera. 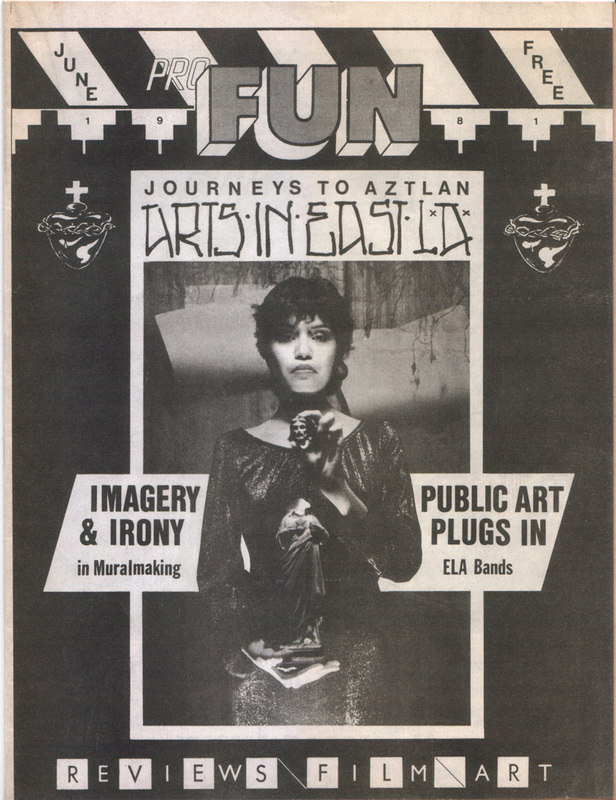 I began photographing in earnest and all of my early photos were taken with that Canon AE-1 including the photo that became the cover of Pro-Fun magazine and another image that became a poster for the band “The Brat” by Richard Duardo of Aztlan Multiples. Within a year or two, All Nations became a victim of budget cuts and the center was closed. Like so many organizations whose constituency is the under-represented, they often lack the political organization to be able to fight the good fight. 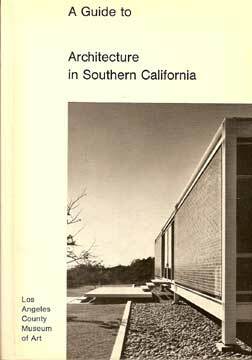 Several years later I came across a wonderful little book called A Guide to Architecture in Southern California by David Gebhard and Robert Winter published in 1965 by the Los Angeles County Museum of Art. The book was filled with the most beautiful photographs of buildings I had ever seen. This book sparked a fascination with architecture that continues to this day. In spite of its size (5 x 6 ¾”), the photographs made a lasting impression. Every weekend I would take the book and ride my bicycle to visit some of the locations illustrated. Nearly twenty years had passed since the publication of the book and many of the locations were no longer in existence. I would set out in search of a home by Irving Gill located in my neighborhood only to be met by a parking lot, but other times my quest would be rewarded by an unknown treasure. I saw many buildings I never knew existed and others, that I knew well, I would come to see in a new light. 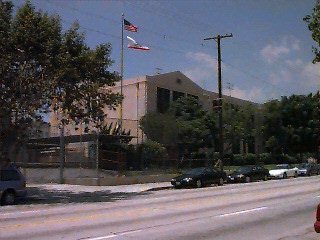 One of the buildings in the book was the Jewish Community Center at the corner of Soto and Michigan Avenues in Boyle Heights. It was then I realized that the All Nations Neighborhood Center had actually begun life as this very same Jewish Community Center. This also answered the question as to why the adjoining gymnasium was called the Max Strauss Auditorium. The book indicated that the architect was Raphael Soriano, one of the Case Study architects. Not everyone knows that Latino Boyle Heights was once a Jewish neighborhood. In early maps I have also seen it labeled Brooklyn Heights, an obvious reference to the borough of New York. Cesar Chavez Boulevard is the former Brooklyn Avenue. 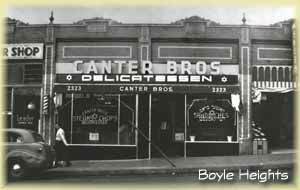 The original Canter’s delicatessen was once located at 2323 Brooklyn Avenue. I was pleased to know that as the neighborhood evolved from a Jewish neighborhood to a Mexican-American neighborhood the center evolved with it. It was also the site of a mural by the late Carlos Almaraz called No Compre Vino Gallo, a mural tied to the long and bloody United Farm Workers struggle and the decades-long boycott of Gallo wines. The mural had long since been painted over, but my friend Daniel had a photo of it so that I was able to see where it once was. As my interest in architecture continued over the years, I learned that Raphael Soriano was recommended for the Jewish Community Center project by a photographer friend of his. The photographer had lived in Boyle Heights as a youth. In addition to the recommendation of Soriano, he also suggested that the building should contain a darkroom and gallery space for the exhibition of photographs. It may have been a strange suggestion for a community center, but Soriano included these in the plans and they were built. I have no experience or knowledge of the community center when it served a largely Jewish community, I only knew it as All Nations. It is odd to think that the suggestion of a single photographer more than fifty years ago would impact my life so profoundly but it did. Photography was my entrance to the arts. 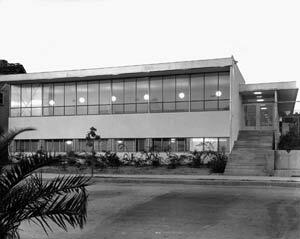 The photographer friend of Soriano’s was Julius Shulman. He died this past Wednesday at the age of ninety-eight at his home (also designed by Soriano) in Los Angeles. I never met him but I always wanted to say something to him if I did. I believe it is never too late. Thank you, Mr. Shulman. Ed. note: The Jewish Community Center/All Nations was demolished in 2006 without a permit for demolition. Kudos to my fabulous editor! I remember Daniel. He became quite a good actor. I hope he his well. I am a jew living in a mostly hispanic neighborhood bordering east Los Angeles. I have made this neighborhood my home for 26 years. I venture into Boyle Heights on many occasions. I remember some of my favorite restaurants were on Brooklyn which is now Cesar Chavez. With home prices crashing in this depressed economy my neighborhood and many areas of East Los Angeles have become the new Park Slope of Los Angeles. Hip new businesses are opening up and people are snatching up the homes for next to nothing. I think that the flavor of the neighborhood will always remain the same. Thanks for painting such a lovely picture in your blog. That Pro-FUN shot is an all-time favorite of mine. A true “rock” pic. I thought it compared favorably with a lot of band shots coming out of England at the time. Funny to hear the origins of its inspiration. for your information, i was wearing “crayons” with red soles. All Nations was my hang out between the ages of 12 and 18. Bill Maxwell, wherever he may be, is one of my absolute heroes. he once took me to beverly hills and bought me a gucci belt, he helped me open my first bank account and told me that whatever i wanted in this life, i could have it, if i really wanted it. so wherever you are Bill, thank you from the bottom of my heart… hi, Seanie.